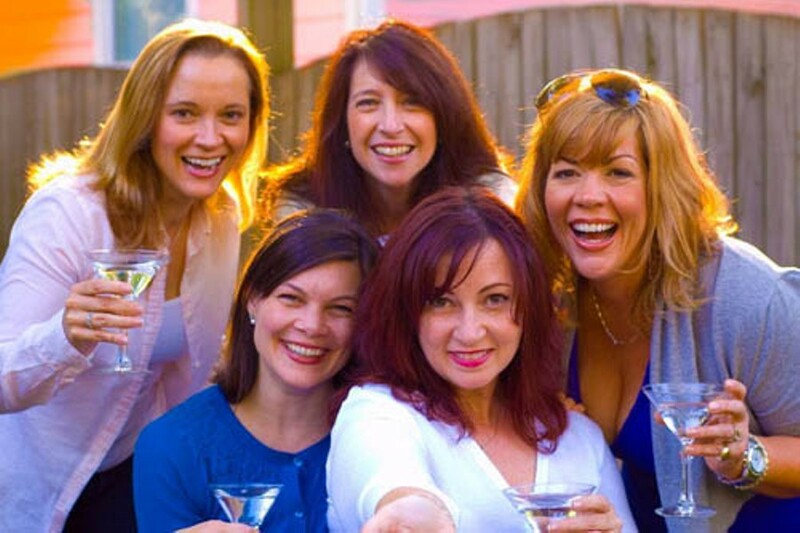 SWIMMING IN COCKTAILS: (l-r) Tonya Bludsworth, Chandler McIntyre, Stephanie DiPaolo, Sheila Snow Proctor and Donna Scott in The Dixie Swim Club. No, the sequel to last summer's Once Upon a Festival hasn't returned to Theatre Charlotte as a Twice Upon a Festival. Although Donna Scott Productions has encamped at the Queens Road barn again on the first weekend in June, and although the festival running through June 26 does have a youth element (teen girls acting workshop on June 16) and a storytelling element ("Three Moons Presents: Words, Laughter & Stories" on June 22), Scott & Associates have rebranded, calling this year's partnership with Theatre Charlotte Create-Participate! 2010. Since those three moons, plus two participants in a play-in-process reading (June 20), and the photographer on exhibit throughout Create-Participate are all women, you won't be surprised to learn that the festival's centerpiece, The Dixie Swim Club, showcases an all-female cast. If you're a guy, sensing that you're not a prime segment of Scott's target demographic, you could be on to something. Women averse to derivative, formulaic comedy might be cautious. We follow the alumna of the Pemberton College swim team as they reassemble over the course of 33 years at an Outer Banks beach cottage (cunningly designed by Jim Gloster), beginning when all five are aged 44. Each of the ex-swimmers filling these templates is formulaic in her own right. Sheree Hollinger was the team captain 22 years before the comedy begins. Now she's the club hostess, disciplinarian, weekend planner, and health nut. At the drop of one of her foul macrobiotic hors d'oeuvres, she might break out the old swim team rallying cry: "The faster we swim, the faster we win." Flirtatious Lexie Richards is the first arrival, lamenting her breakup with husband No 3. Subsequent gatherings will feature lamentations over later husbands in Lexie's serial marrying career, a new hair color for each scene, and fresh discussions of her latest flirtations and cosmetic surgeries. Selfish and vain? Sure, but Lexie has a serious, sensitive side that she only reveals to her lawyer teammate, Dinah Grayson. She arrives next, clad in a business suit, hurrying to unpack her signature contribution to the festivities, a cocktail shaker and a set of martini glasses. Dinah's drinking begins at breakfast and continues nonstop. When she isn't talking or drinking, she's most likely to be heading toward the kitchen for a refill. But Dinah isn't merely cold and overstressed. She has a warm, magnanimous side that she keeps under wraps. Vernedette Sims is the hard case of the club. Invariably she arrives at the cottage with a fresh infirmity -- a broken arm, a broken foot, and a broken brain, with a neck brace in between. Fresh tidings of the further trials Vernedette has endured via her trashy husband Burl and her two ne'er-do-well kids are always forthcoming (she conceals nothing! ), but only after her customary dash to the upstage lavatory where she must urgently pee. The club's recluse and outcast, Jeri Neal McFeely, arrives last. In another homage to formula that strains mightily at the bounds of possibility, playwrights Jessie Jones, Nicholas Hope and Jamie Wooten save their biggest surprise for Jeri. For most of the past 21 years, Jeri has taken leave from a convent each August to join her secular sisters. But this year, the nun has a revelation guaranteed to elicit scandalized gasps and titters from blue-haired churchgoers. In good conscience, I cannot disclose it. Frivolous as the script may be, the cast is exceptional. Spindly and athletic, Stephanie DiPaolo is a perfect pick for Sheree, a prime foil for the grumblings of her underlings, yet credibly vulnerable as she maintains her controlling teetotaling façade. Not content to merely produce, Scott has plucked the plum role of Lexie for herself, sporting no fewer than four different wigs over the course of the evening and looking outrageously ready for fresh sexual prey even when she reaches the age of 77. A queen of collagen. Scott was badder as Jacklyn Dabadie in Tonya Shuffler's Carrie Ann's Kiss in 2006 and 2007, but no one can accuse her of overreaching as Lexie. Look! It's none other than Shuffler, now Tonya Bludsworth, who returns the favor as the briefcase-wielding, gin-swilling Dinah. No stretch for Bludsworth, either. On the contrary, after her exploits in The Road to Mecca up in Cornelius last month, Dinah represents a precipitous drop in demands upon Bludsworth's talents. Likewise, the innocence and optimism of Jeri Neal are qualities that Chandler McIntyre has shown us since a previous century. I'd say that McIntyre could do the role in her sleep, but that would convey an impression totally opposite to the sunny energy she brings to this naïf. Sleepwalking is actually the exclusive province of Sheila Snow Proctor in her hilarious show-stealing performance as Vernedette. Tranquilizers or Quaaludes may be at the root of this deadpan gem, but after watching Proctor's career in Charlotte evolve from her early years declaiming pentameters as Chickspeare's butchiest crossdresser, I never thought I'd see anything like the quiet, rusticated resignation that she makes so screamingly funny. When we can hear her. As an actress, Polly Adkins can recall my first appearance on a local stage, but after her solid contributions to last year's fine production of The Full Monty, this is finally her Charlotte directorial debut after piloting a Fort Mill effort last November. She has a sure grasp of how Dixie works. When each of the guests, one after another, tastes Sheree's hors d'oeuvres, they all do the same expression of disgust instead of individualized ones. Sadly, Adkins hasn't cracked the whip sufficiently when it comes to getting her ace women to project. In her outsized diva persona, Scott is the only person onstage who is always audible and intelligible as far as Row C. I've only singled out Snow because her dropouts tend to occur at the ends of sentences where sometimes the juiciest punchlines lurk. Listening to the ladies behind me querying each other about what Vernedette just said only magnified the problem.